In the selection procedure for taking part in the ‘North Bund’ international ideas competition in Shanghai Gensler, USA, Cox, Australia and AS&P, Germany were the companies that prevailed. AS&P emerged as the ultimate winner of the competition. The area that was the subject of the competition, what is known as the ‚North Bund‘ in Hongkou District, covers some two square kilometers and plays an important role in Shanghai‘s urban development. 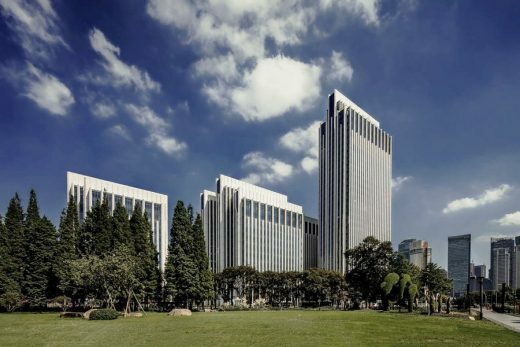 The site lies opposite Pudong peninsular to the north of the historical Bund, and as the third major develop­ment on Huangpu River is intended to provide the two famous districts with important services and public facilities. The AS&P concept makes use of the prime location and outstanding access through a concentrated urban, vibrant new ecological quarter, with a networked system of small open spaces with a high-quality environment. Inner-city concentration, mixed usage, conversion and the reduction of individual private traffic through excellent public transport are integrated in a sustainable planning concept. A core zone of some 70 hectares offers inner-city facilities, primarily shipping-related services and office buildings. The two landmark high-rises in the west and east are linked by a pedestrian precinct, surrounded by 4-storey podiums with retail outlets, entertainment, and bars and restaurants. However, it also provides access to the residential and office towers, which very much give the core zone a calm rhythm and its face. Two subway stations in the east and west connect the pedestrian precinct with the public transport system. They also lead to large underground areas boasting shopping malls and the new international ferry harbor terminals. In the approx. 1.3 square kilometer outer zone the focus is on preserving existing fabric and its careful rounding out with new structures. Overall, in the next few years some 1.8 million square meters of new buildings will be constructed in the area that was the subject of the competition.